The new Virginia deputy secretary of transportation, Nick Donohue, recently told to the Commonwealth Transportation Board that the McAuliffe administration will use a different approach to transportation planning. 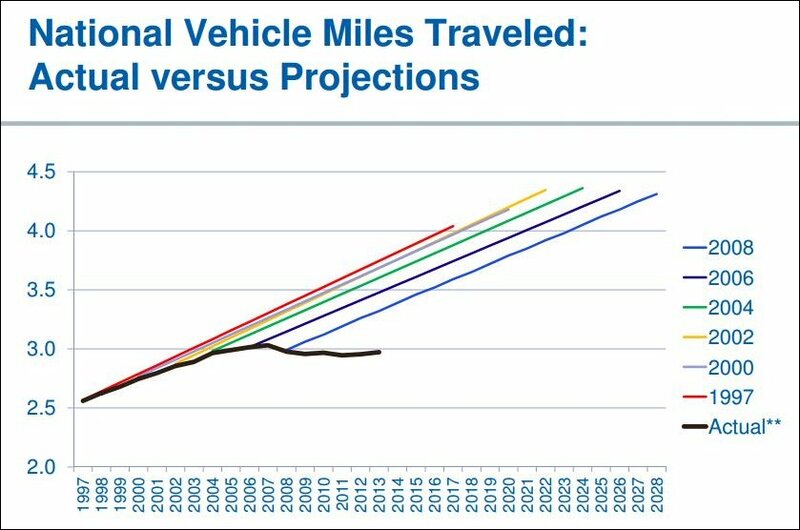 In the past planners have overestimated how many miles people will travel by car and underestimated the demand for alternative modes of transportation. Virginia’s forecasts suffered from similar biases in the past, he said. Now VTrans will begin considering non-traditional indicators of travel demand. For example, Donohue said, the number of 20- to 34-year-olds not getting their licenses has edged up from about 10% in 2000 to 15% today. A National Association of Realtors (NAR) survey found that a majority of respondents indicated a preference to live in walkable communities with mixed-use development. More families are moving into multifamily housing. And a NAR analysis found that the sales prices of houses located near transit out-performed other housing by 41% over the last five years.